For electronic copies of service publications, you can purchase a subscription to Service Express. 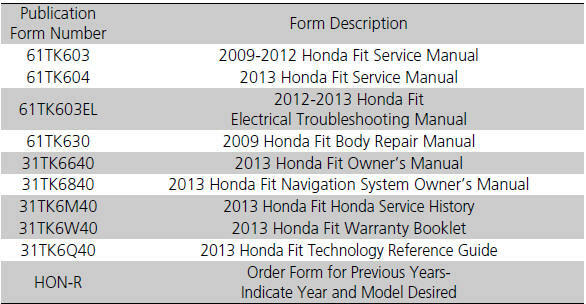 Visit www.techinfo.honda.com for pricing and options. The publications listed below can be purchased from Helm Incorporated. You can order a manual by phone at (800) 782-4356 (credit card orders only), or online at www.helminc.com. Make an inquiry to Helm Inc. at (800) 782-4356 if you are interested in ordering other models’ or other years’ manuals. Covers maintenance and recommended procedures for repair to engine and chassis components. It is written for the journeyman technician, but it is simple enough for most mechanically inclined owners to understand. Complements the Service Manual by providing indepth troubleshooting information for each electrical circuit in your vehicle.